I never put pants on today. Today looks really silly in pants, anyway. Been making a effort to stay out of political forums for a month or so. Been in a few threads that turned toxic over representation, one started by me which I should have known better posting on steam forums. I just came to the realization there is no point in taking part in some threads when I don't really care about the person the thread is about. Social media isn't the same as real life. I shouldn't think the same rules should apply. I'm not even sure I should think of it as real on a larger level. Like some people get millions of views and followers like Ninja. However, I didn't know who this guy was until recently and no one I know in real life knows this guy. I don't know, maybe real life isn't real either. Wait that is just a movie. Which is considered a stronger, more offensive language? "Sodding" or "Bloody"? It is my understanding that neither are exactly equivalent on the obscenity scale to a f-bomb, is that correct? EDIT: More importantly, Pillars of Eternity 2 is on sale on Steam again, 40% off the Obsidian Edition with all the DLC. I'm going to get it eventually, but do I get it now? Or wait until the winter sale? EDIT v2: I buckled. Nevermind. While sodding my lawn the police shot at me causing me to get all bloody. Holy carp, Baron, I’m so sorry. Are you okay?!? That was a very believable statement. Well, it **is** the non sequitur thread. ^^ I'd rather be wrong and silly, than right, in this instance. Both are "polite swears". You'd use them in place of "f*cking" when in polite company. They're roughly equivalent to each other in terms of rudeness, which is to say, not very. "Sodding" had fallen out of use and only old people use the term now. "Bloody" is ubiquitous. The house we're renting has the kitchen sink plumbed in a manner that has hot water available instantly when you turn on the tap, which seems like a good idea until you spend a good 40 seconds with running water before it's cool enough to drink. There's a hot Japanese lady wrestling in WWE now. Roland, you aren't ready for Asuka. Someone should turn on the air conditioning for the poor woman. I would assume that being a star wrestler pays well enough that she could buy her own air conditioner and hire someone to flip the switch? This is not the Dad Joke thread, SALLY! Actually, I thought Sally’s dad joke was a step up. It was more meant as a deflection and an attempt to forstall talk about how attractive a wrestler is, out of respect for our female members. Is calling someone hot, not respectful? Depends on who it is and your relationship with them. Just didn't want to even go down that rabbit hole. Know your audience. We can be that place on the internet where men don't need to constantly rate and discuss how attractive women are, can't we? That's hot, SallyNasty. Empathy and consideration are attractive. So hot. Full respect, though. Which is what I saw, and why I meant a “step up.” Thanks for that. Woke up this morning to find a split in my headset. 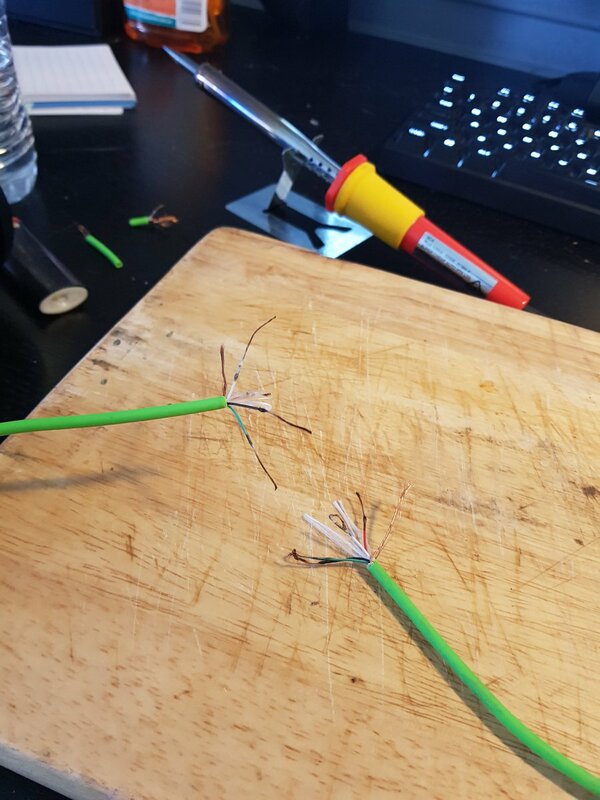 My cat had chewed through the wires while I was sleep. 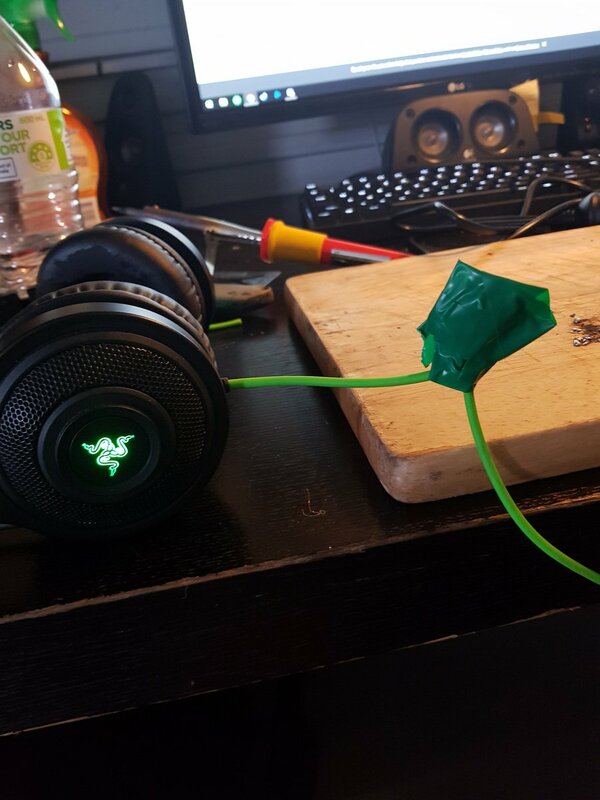 I wasn't ready to spend another $120 on a new set ( I really love these, despite them being "GAMER" brand), so I figured I'd try my luck with a repair job. Soldering irons were only $10 down the road...So what did I have to lose other than some pocket change? And it worked?! The insulation is really messy and it kinda rubs up against my chin which is annoying, but I'm honestly just so proud that I was able to fix this with minimal knowledge. It's really amazing what you can learn from Youtube videos and a few google searches! I truly hate how looking for a new job is, in essence, like having a second job. On my phone I just watched the Amazon delivery guy on his path to deliver 5 packages before mine, get right across the street from me and then drive 2.5 miles away, and now apparently is enjoying lunch at a nearby Wendys (or the bar that is right next to it).